After the marathon of moviemaking that was The Lord of the Rings trilogy, writer-director Peter Jackson was uniquely qualified to tackle J.R.R. Tolkein's The Hobbit, which he and fellow screenwriters Fran Walsh, Philippa Boyens and Guillermo del Toro decided would be split into two films. The first of these, The Hobbit: An Unexpected Journey, will make its world premiere in New Zealand November 28th, 2012, with this prequel's sequel, The Hobbit: There and Back Again, hitting theaters the winter of 2013. But now, after 266 days of production that kicked off in March of 2011, both films have officially wrapped on principal photography. The story of The Hobbit films precedes that of Frodo and his crew by 60 years, and so centers on a brave little Hobbit named Bilbo Baggins and how he obtained the powerful ring at the center of the trilogy. In The Lord of the Rings movies, Old Bilbo was played by celebrated character actor Ian Holm, but An Unexpected Journey and There and Back Again will star Sherlock's Martin Freeman as a younger and more spry Bilbo who goes on an adventure with a pack of pugnacious dwarves that seek to defeat the vicious dragon Smaug, who will be voiced by Freeman's Sherlock co-star Benedict Cumberbatch. However, Holm will make an appearance, as will a plethora of LOTR castmates including Andy Serkis, Ian McKellen, Christopher Lee, Hugo Weaving, Orlando Bloom, Elijah Wood, and Cate Blanchett, all reprising their roles from the heralded LOTR trilogy. Newcomers to the Tolkien franchise include Luke Evans (Immortals), Evangeline Lilly (Lost), and Lee Pace (Pushing Daisies). The Hobbit: An Unexpected Journey will open in the U.S. on December 14th, 2012. 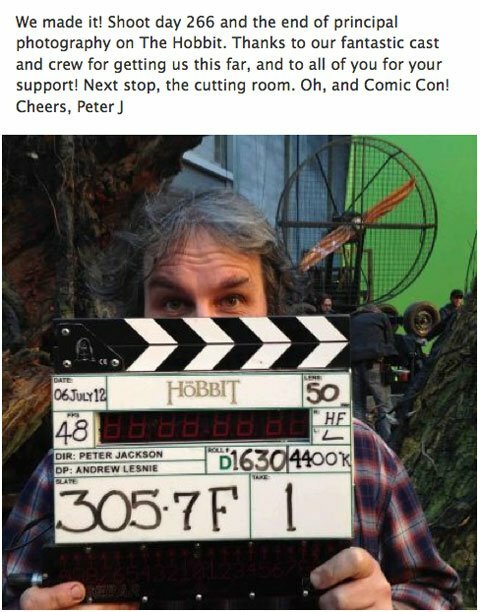 The Hobbit: There and Back Again will follow on December 13th, 2013.